PHILADELPHIA, PA – June 27, 2017– Janney Montgomery Scott LLC (“Janney”), a leading full-service wealth management, financial services, and investment banking firm headquartered in Philadelphia, PA, announced today that Davina DeMark has been promoted to Diversity and Inclusion Programs Manager. In this newly created position, Ms. DeMark will plan, implement and measure diversity and inclusion programs, coordinate internal and external recruiting and community engagement initiatives, support the firm’s five Employee Resource Groups and the employee-led Diversity and Inclusion Council, and ensure alignment of diversity and inclusion objectives to Janney’s business goals. 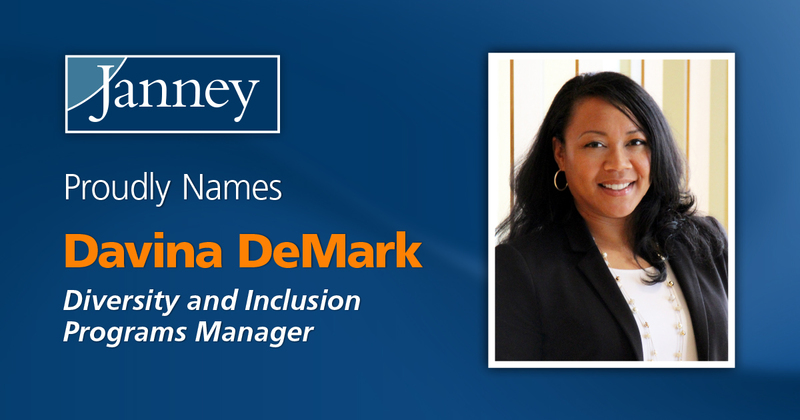 Ms. DeMark joined the firm in 2013 as a Reorganization Associate in Operations. Since 2014, she has held the role of Human Resources Training Manager where she engaged with employees and leaders across the firm in the development and execution of various professional development programs. She has an extensive background in financial services including roles at Vanguard and U.S. Bank.